Piecing together ways to save money, protect the environment, and keep kosher. I have mentioned before in several posts (“Office in a bag: A great Flylady tip,” “Setting up your Pesach Control Journal,” and “When did we repair that last?”) the benefits of putting together helpful tips and forms in one place for a specific purpose. My routines list in my planner helps me stay on top of things at home (I also have one for work). My menu planning, grocery list forms, and price list make menu planning and shopping easier. My Home Maintenance Journal helps me keep track of home repairs and information about our home and appliances. My Pesach Control Journal helps me keep track of all that needs to be done before Pesach and all the articles and tips I have gathered for it. But I have been thinking a lot lately about how many things that I take care of in our home that my husband doesn’t necessarily help with. He is definitely a big help with so many things (cooking, dishes, changing the laundry, errands – to name just a few). However, I do a lot of the “home management” stuff. It made me realize that if G-d forbid something were to happen to me, my husband might not know where all that important information is (or even where important things in the house are!). I decided that I am going to babystep my way (as Flylady says) in putting together a Family Control Journal. A fellow blogger at OrganizedJewishHome has her own Control Journal called a Shalom Bayit Book. She uses hers mostly for her own purposes, but she has some great tips and forms, which complement those on my blog. What I am proposing is a slightly different book – one that would be good for emergencies, long-term stays away from our kids, etc. It will have a variety of information in it that my husband may not know where I keep. Now, I have had two long-term stays in the hospital on bed-rest where my husband had to take care of everything at home without me. However, some things were just too complicated for him to handle – like the bills. He didn’t quite know my system or where everything was kept. One part of this control journal will include that. 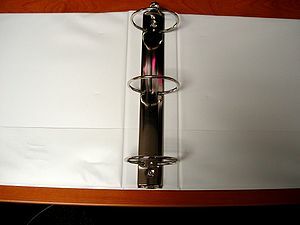 First get a 3-ring binder just for this use. We are going to add one component at a time. For this week, print and fill out a “Medical Consent Form for your Children.” If you are single, this is good to have for yourself in case of an emergency. A good friend of mine, Michelle, keeps this information by her door in a marked envelope. You might want to put the finished form and the article in a page protector. Step one complete to starting your own Family Control Journal! * If you decide that putting together this binder is too much for you, print this form and keep it with your babysitter information, so you will have it if needed. Glad you like it. Tell me how yours turns out! I didn’t realize you knew about / had noticed the envelope… Definitely gives me peace of mind knowing that if something happens to me, my friends can act on my behalf, knowing what I want and need! What does an oil change cost? There has to be more to eat before Pesach than potatoes!